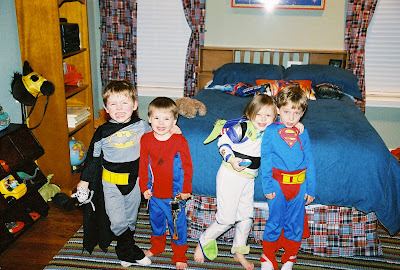 From the time my son was 3 till he was ready to enter Kindergarten, he was almost never out of a costume. On any given day, he was Spider Man, Superman, Batman, and any number of super heroes. He spent hours jumping off couches to fly through the air. He ran a thousand miles around the backyard catching bad guys (our dogs, usually). He spent days in his secret hideout (the backyard swing set/playhouse) plotting how to rid the world of evil with his fellow super heroes (pictured below). That's why I just LOVE this new commercial from Volswagen for the new Passat. It's just awesome and takes me back to the days when I would hear my little guy yell, "Mom! Where's my cape?!"